I had little time for cooking last night, after a long afternoon of weeding while partner struggled manfully with putting up a new chicken run. But our soup and salad meal included celeriac, chard, carrots, lettuce, potatoes and apples, all from the garden, plus pears from a neighbour’s tree. There could have been cobnuts too, if I’d had time to shell them. 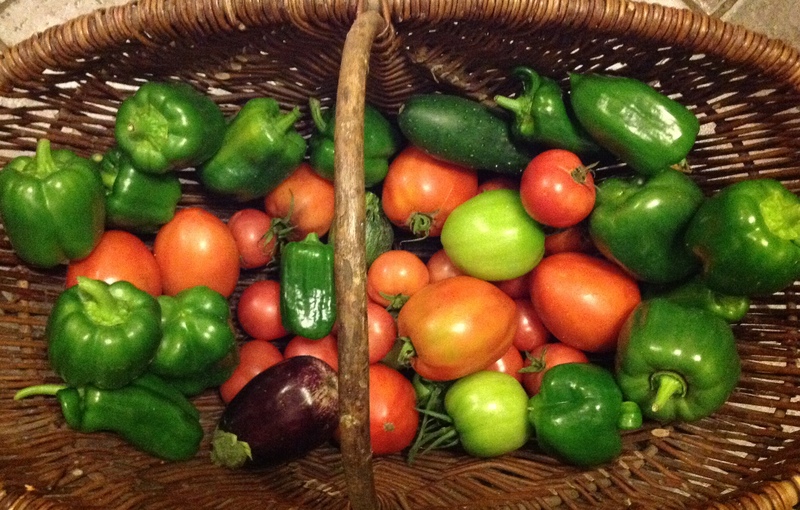 And the basketful of peppers and tomatoes, pictured above, is still untouched, demanding my attention today. I know, I know that all this bounty does not come by magic, but after weeks and months of sowing and tending by partner (mostly) and weeding by self (mostly). But at this point in the year, when there is just so much and it is so good, it seems like a miracle, like manna from heaven. And when I look at the enormous tomato plants, the weighty fruit hanging from them, and remember the tiny seeds they came from, I am amazed, as every year, by the magic that turns one into the other; by nature’s conjuring trick that gives us all this food. It is one of those moments when this lifelong atheist craves religion; I would like there to be someone to thank for the magic and the bounty. Well a blog is not church, but here I am saying thank you nevertheless. All this food is amazing and I love it. 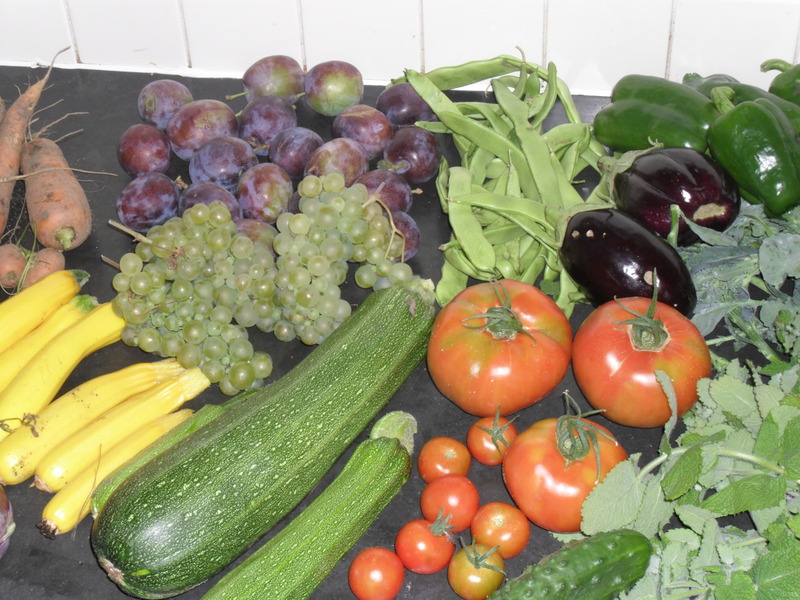 Below is a picture from three years ago, taken in our Manchester kitchen, with bounty from our allotment there. I’ve been looking at pictures (see the Facebook page) from past years, remembering friends and fellow plot-holders, loving it as the start of a journey which brought me here. That’s the magic we make with preserves, we bottle summer, make ourselves a memory and a promise it will come again, for when we are lost in depths of winter. This is my last preserving post for the time being, just as the rosehip syrup of Monday’s post was the last outing for bottles, jars and jelly bags – until February and marmalade-time come around again. I thought you might like to know what I have been making this year. 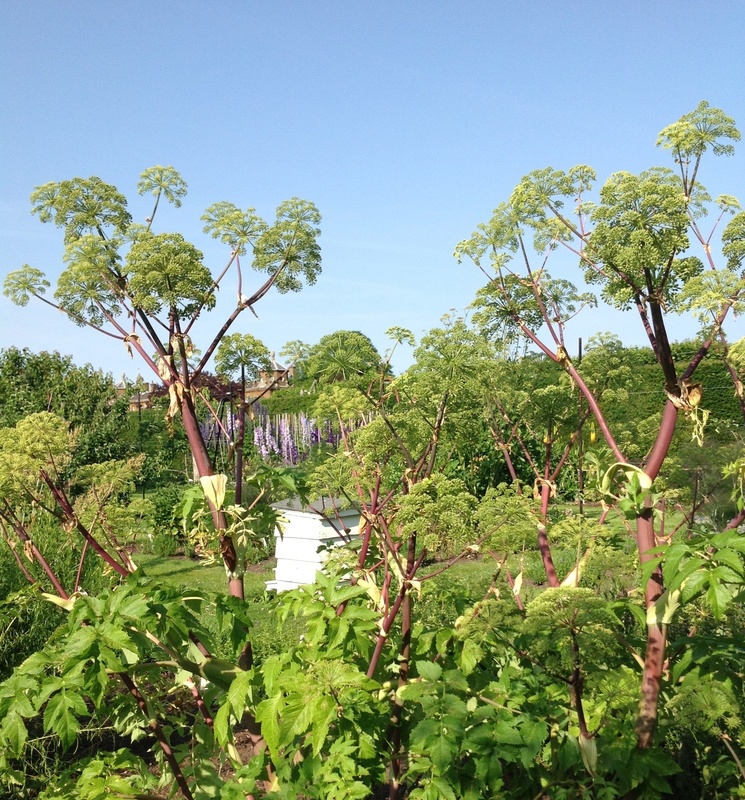 Jams: rose & rhubarb, redcurrant & gooseberry, black & redcurrant, plum with cumin, blackberry & plum and fig & plum. 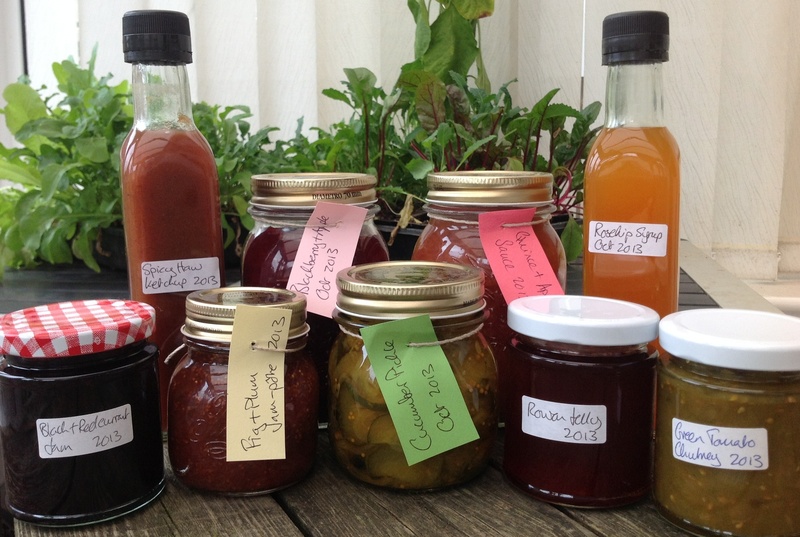 Chutneys (made by self or partner): courgette & apricot, green tomato, damson & apple and spicy mixed vegetable. Also: cucumber pickle, hawthorn ketchup, rowan jelly, black hedgerow jelly and plum & apple mincemeat for Christmas. Then there was the membrillo or quince cheese, which kept me up, watching and stirring, until 3 o’clock in the morning. And jars and jars of fruit compotes and sauces, mostly apple, with blackberry, quince or plum. Our one apple tree was laden and we couldn’t bear to throw away such good food, even onto the compost heap. I love this laying down the bounty of summer and autumn against winter’s scarcity, even though it’s no longer necessary. It connects me to the changing seasons, the turning year, and to centuries of people doing this before me. It gives me a comforting sense of prudence and providing; and feeds my sense of history. I must remember all this next time I am swearing and sweating in the kitchen over a pan of fruit. Next year perhaps I will remember to invite friends to share the work and bounty both – though not to stay up until the early hours! Tap the photo for a bigger version if you want to read all those little labels. Autumn has a sadness to it as days grow short and cold and vegetation dies all around us. Yet it has its own energy and pace; the dying plants are reproducing, new life lying in wait for the spring. Fruits and seeds feed us, feed other animals; more life arising out of death. I have felt a childlike, secretive excitement this year, anticipating the colours and change of autumn, the season Lincolnshire has yet to show me. And as the days shorten, I feel the world racing towards the solstice, into that darkness from which we emerge into the light once more. ‘Mellow fruitfulness,’ said Keats in his Ode to Autumn. Yes, my autumns are full of fruit. But mellow? 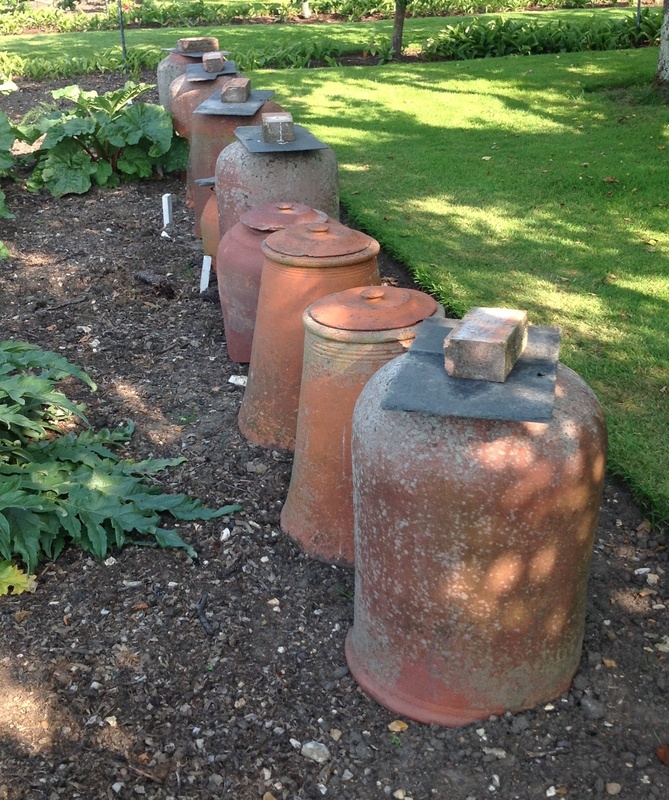 My autumns are a busy time, when I dream of jars and preserving pans. 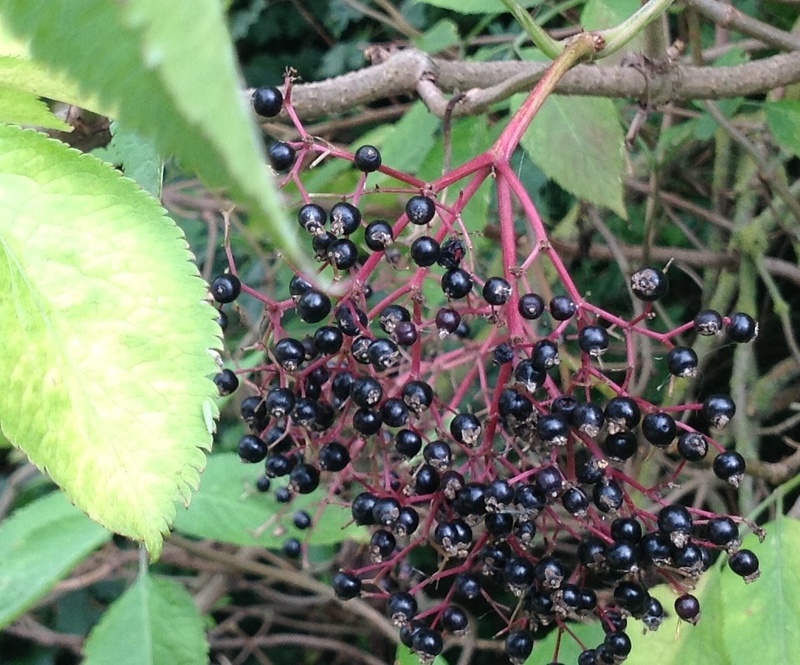 Our new garden has just one apple tree, but the hedgerows are dripping with blackberries, elderberries, rowanberries, rosehips. And house after house has a table outside selling excess apples or plums for next to nothing. Last autumn, sweating over chutneys in our Manchester kitchen, waiting for the house to sell, allotment produce heaped around me, I imagined this next one would be slower, quieter, with a pace like Keat’s lovely poem. I hadn’t reckoned with the bounty of the English countryside. Once again I have been sweating, chopping, stirring: stuffing summer into bottles while partner makes wine out of everything. Now we only have to eat it all up. 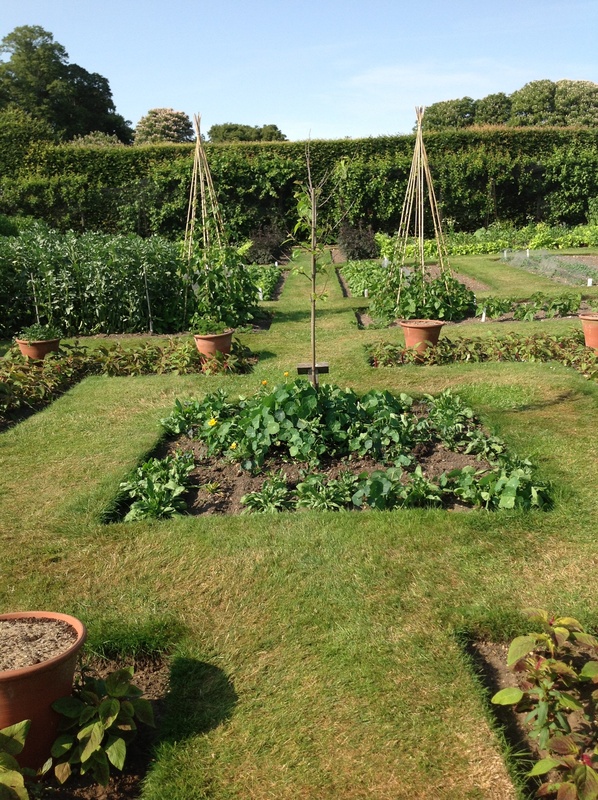 As said in the previous post, my mum and I spent a day seeing gardens in Norfolk, of which my favourite parts were, as they always are, the kitchen gardens. Those pictured above were are Houghton Hall where we also saw a collection of paintings which once belonged to Robert Walpole but have been living in Russia since his heirs sold them to Catherine the Great. They are everywhere I look in the garden, the daffodils; gold, primrose and white, tossing their heads in the wind, as they do. I’ve written more about the leylandii hedge than about the rest of the garden, which is lovely. It is a great treat to have inherited so many flowers: there have been snowdrops, hellebores and primroses, then the daffodils, and tulips on the way. And with the warmer weather, at last, there are all sorts of perennials starting to emerge from patches of dead stalks and bare earth; aquilegia and foxgloves, among my favourite flowers, are appearing in all sorts of unexpected places. I have a few cut-and-come-again seedlings in the conservatory. They look so fresh and green that I want to eat them now, but they are still only babies. Meanwhile I try not to check the length of the rhubarb coming up outside more than every couple of days. Soon, soon it will be big enough to cut. Yesterday I potted on all the soft fruit cuttings I took from the bushes at our Manchester allotment (a small act of faith, made long ago, before our move was really on the cards). I am pleased to have something here from that patch of ground that my partner put so much into over seven or eight years. Today I am going to sow beetroot and carrots. And partner is thinking of putting early potatoes in some messy ground where the polytunnel will go later. Feels very daring to be doing such normal things for the time of year. More acts of faith and commitment to this, our new piece of earth. Is spring sprung at last? 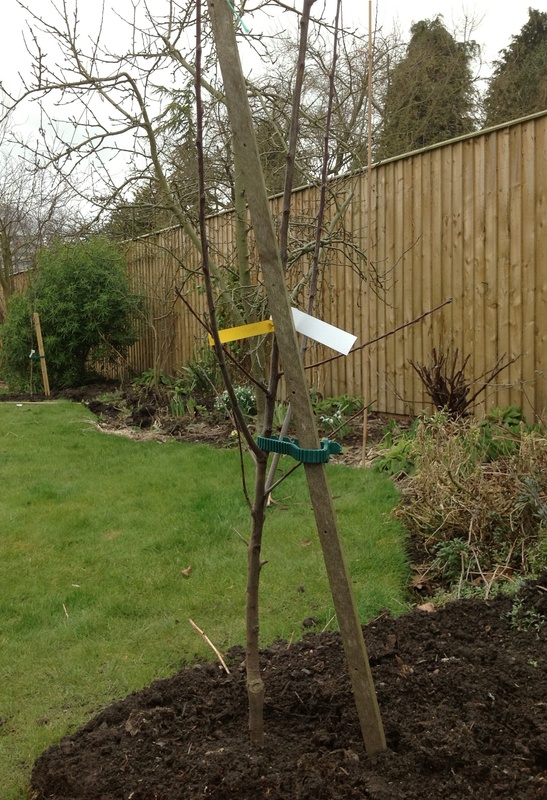 I planted a plum tree and a greengage yesterday. 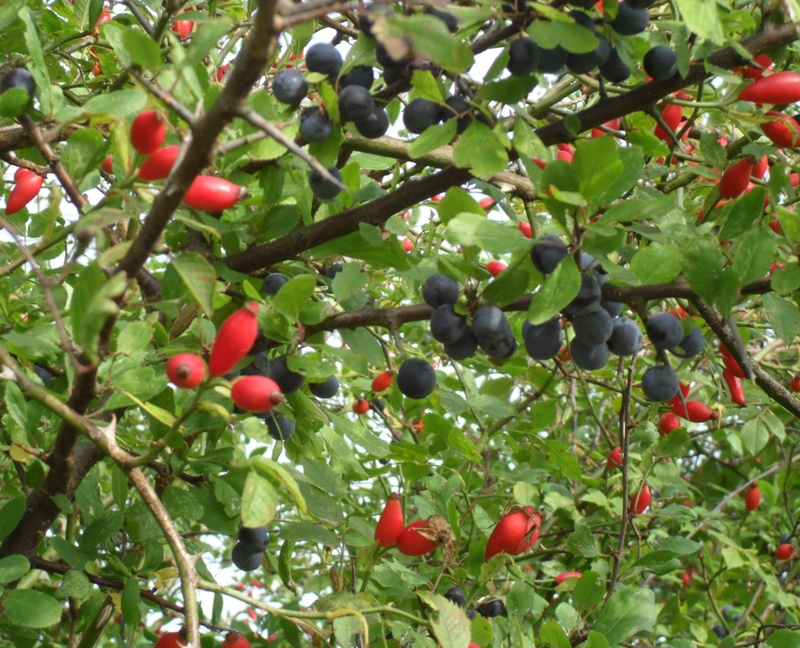 The one in the picture is the plum, a variety called Czar which is early and supposed to be good for cold climates. 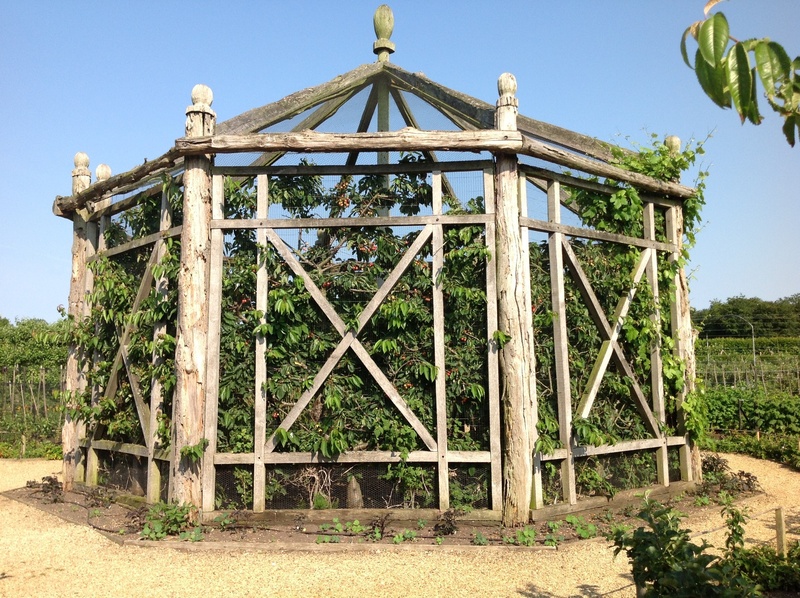 The gage is called Ingalls Grimoldby Greengage, named after a Lincolnshire village called Grimoldby, near Louth, and William Ingall, who had a market garden there in the nineteenth century. 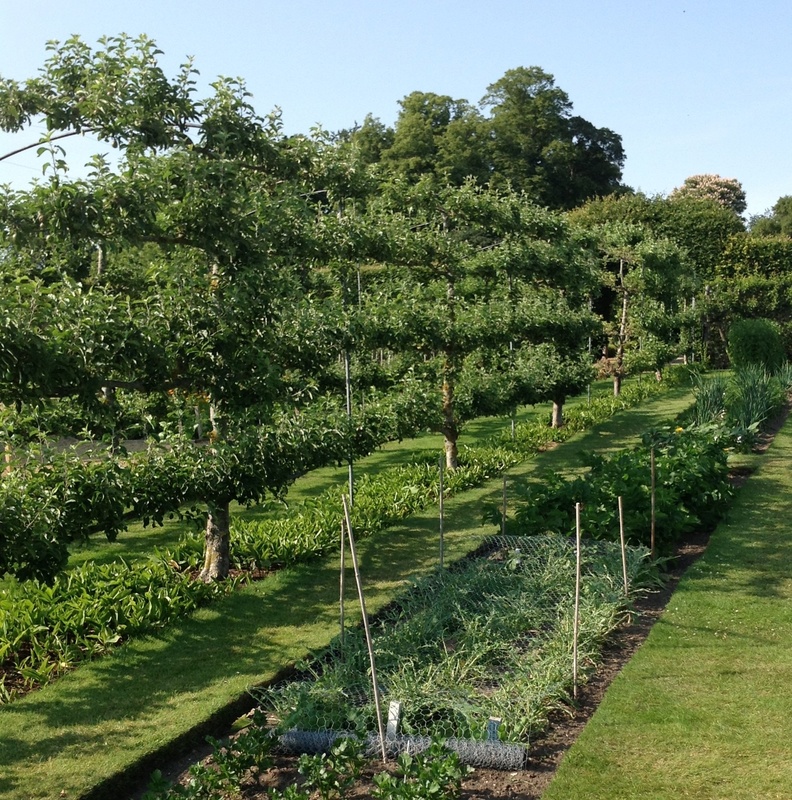 He raised five varieties of apples there, along with the greengage. I had ruled out having greengages before I found this one, thinking that we are too far north. The helpful man at the East of England Apples and Orchards Project, from whom I bought the trees, told me that Lincolnshire was the furthest north they were generally grown, and Cambridgeshire the furthest north that they were grown commercially in the past. I like the idea of keeping old varieties of fruit that were developed in my newly-adopted county. I should have waited until the autumn when we’d had time to make a proper plan about fruit trees, but I didn’t. Oh well. Other fruit likely to be grown against fences – perhaps even an apricot one day, on the back, south-facing wall of the garage (see picture in Leeks past and present post). I have been reading about Norse and Saxon place-names in the county, and England in general (of which more some other time). Grimoldby looks like a good Norse name; Heckington is squarely Saxon. For some reason things being Saxon gives me a sense of age and continuity while Viking names conjure up something wilder, more exotic, with a sea breeze and salty tang in it; a bit irrational, I know.